It is a simple formula. Pi x diameter in inches x rpm (or 2 Pi r). You said that a 3" brush at 2350rpm was good, so 9.424778 is the circumference and 22148.23ipm the speed. The 10" @ 1100 is 34557.52ipm and @ 550rpm, it's 17248.76ipm. 705rpm brings it to the same as the 3", 22148.23, or 31.76fps. Something itchy in the back of my head says that wire wheels are counted by the bristle rather than sfm. 550 it is, then. What's the density diffenenc between the old 3" and the new 10"? Most 3" wheels I've seen are pretty sparse, and large wheels tend to be much more densely bristled. At 550rpm, you may already have the same number of whiskers whisking per rpm as the 3". I'll bet Tawm knows the actual term for that. <snort> And I know from experience that faster and/or denser wheels are harder to get to dig down to clean the root of the thread. have earned, but it is not greed to want take someone else's money. eel, and everything works perfectly now. This wheel should last for years, so I will stop fretting about finding 3" wheels that are real brass. he big wheel. I guess 550 just seemed so slow! 2200, but a bit more involved to get other speeds. Yes, 550rpm works well for initial cleaning with tripoli. I think I will try a Tampico brush for t he final finishing, as that is still a bit laborious. I use a super fine co mpound that is not rouge, and I use heavy sewing thread to clean it out of the machine threads. Yes, this is a process intensive operation, but my nic he market seems to appreciate the effort. I'm still in business, anyway! http://i1262.photobucket.com/albums/ii619/Modelbauer1963/fingerjoint.jpg This saves me the problem of the parts moving around under the torch, and t he shallow hole holds the solder nicely. When everything goes well, the sol der creeps up just into the places I want it to go, and little gets onto th e exposed thread. I can see exactly when the solder has gone molten and flo wed through the joint. I still can't figure out what is happening with that 5% of the parts where I have to keep the heat on for longer, creating majo r fire scale which will be time consuming to remove. It's almost certainly down to how well I apply the flux, but I'm pretty careful about this as wel l. Anyway, it's gratifying to see progress at least. I think I invest less than half of the time soldering, cleaning, and polishing than I did a year ago! Oh, I forgot to mention. That black stuff is leather. http://i389.photobucket.com/albums/oo340/robobass/threads_zpsxgwuln1x.jpg Now I am applying something called Stop Ox II with an airbrush, which minimizes waste quite effectively. Upper right is the typical result after a vinegar pickle in a ultrasound bath. Lower right is when something went wrong and I had to torch the part for way too long. 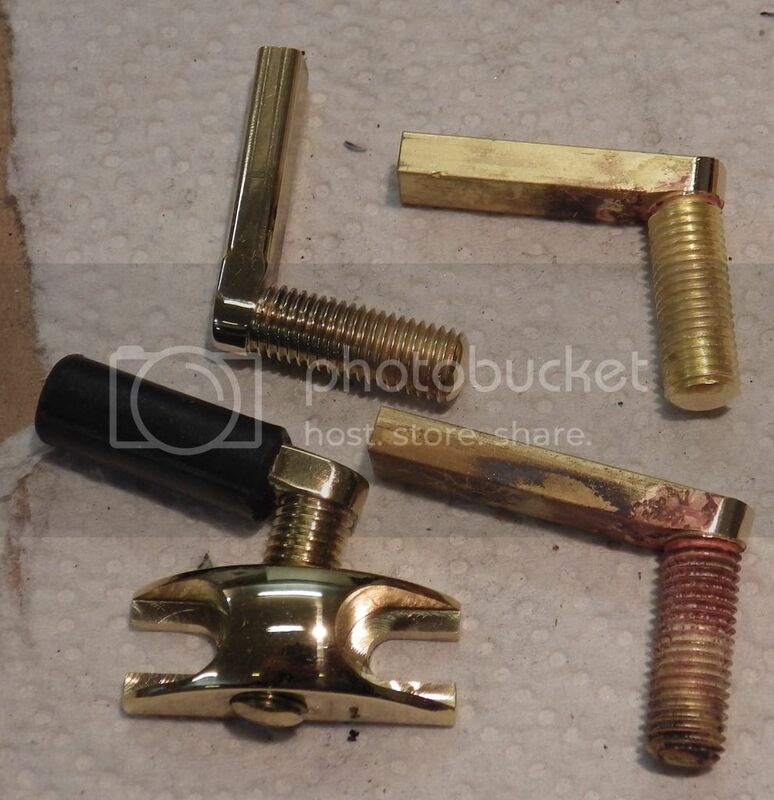 Upper left is after using a .008 brass brush with tripoli, and lower left is after finishing with a cloth wheel and fine compound. I was happiest when running a drill press mounted 3" wheel at 2350rpm, but I simply can't get those wheels anymore. The suppliers will insist that they are brass, but they are all plated steel these days. I have a 10" brass wheel that I run on the lathe at 1100rpm, which is maybe too fast. I get good fast cleaning, but a bit too much scratching, and I can't just drop it in the ultrasound bath to clean it. Overall I'm in pretty good shape, but I'd still like to find a bristle wheel for the fine polishing stage. McMaster has Tampico brushes which look good, but I wonder how long they will last, as they aren't exactly cheap. ======================================================= Did you try adding hydrogen peroxide to the acetic acid? Should do a much better job of cleaning. Probably still won't be good enough to replace the Stop Ox II, but maybe on pieces that need extra heat it would help. Eric, I did find some better implementation of the nylon brush wheel. It is 4" Di a., with bristle length of about 1.5". I made some 3" discs to close agains t the brush in the mount, allowing only a half inch of active flex. With fi ne polish this brush is now quite useful. Thanks for suggesting it! Looking at the picture. it looks like the fuzz in one one side. So I am g uessing the parts were cut off on a table saw. So maybe you could rotate the part as it is being cut off so less fuzz in c reated. So the saw blade in always cutting into the part. Bad description , but I can not think of a better way to describe it. You might also try a different saw blade or maybe a brand new one. guessing the parts were cut off on a table saw. created. So the saw blade in always cutting into the part. Bad descripti on, but I can not think of a better way to describe it. Actually I cut 'em with a wet abrasive cutoff saw, as it had the thinnest b lade and so wastes the least material. I'm going to try again with a cold s aw tomorrow. I've also now got access to a 100w laser cutter and we're goin g to take a whack at cutting the parts out of plate instead of whittling ro und bar. Laser means no fuzz at all and that may wind up being the winner. --Actually waterjet would probably be awesome but it's expensive. OTOH our hacker space just got that big laser and, after learning how to use it, I can walk in any time and knock 'em out with that. selling it would be illegal. I've cut acrylic and polycarbonate with a triple chip blade that came out very clean. Blade wasn't cheap. Have you talked to a plastic supply house? Maybe they can advise. blade and so wastes the least material. I'm going to try again with a cold saw tomorrow. I've also now got access to a 100w laser cutter and we're go ing to take a whack at cutting the parts out of plate instead of whittling round bar. Laser means no fuzz at all and that may wind up being the winner . I thought table saw because that is what I would use on plastic. So you mi ght try a table saw. I think a sharp blade would produce less fuzz than an abrasive saw. It might be cheaper to use a somewhat thicker blade if it eliminates the fuzz problem. If you are making several thousand parts , it would be worth trying many ways to cut the parts. One advantage of the ta ble saw is that it can be very fast if you set up a stop for length. Watch out cutting plastics with a laser. The toxic smoke is a serious problem with many plastics (I don't know which ones, but you could find out). Waterjet is the preferred method these days. Not as far as I know. I saw one cutting shapes out of 1-inch UHMW, which has produced lots of fuzzy burrs when I've cut it, and it came out clean with the waterjet. Got a weed burner? <evil grinne> Or ask the old lady for a cuticle trimmer. Might work. What's your tolerance/qty/dlvy date? RE: the parts, are you now making -toy- steamboat paddles, Ed? Ed - I use a 4000 rpm, 10 in. "miter" saw with a carbide wood cutting blade as a cut off saw for acetal (non filled delrin equivilent), acrylic, aluminum, copper & brass. A vice is clamped to the saw's table and always used, which may have an effect on the burrs generated. The burrs left on the acetal & acrylic are removed with a stroke or two of sand paper. As this is being written, a piece of machined acetal is sitting on the desk which, I just noticed, hasn't had the burrs from one cut of the cutoff saw removed. The 1/8 in. thickness of the carbide blade may yeild a better cost economy than the thin abrasive wheel. 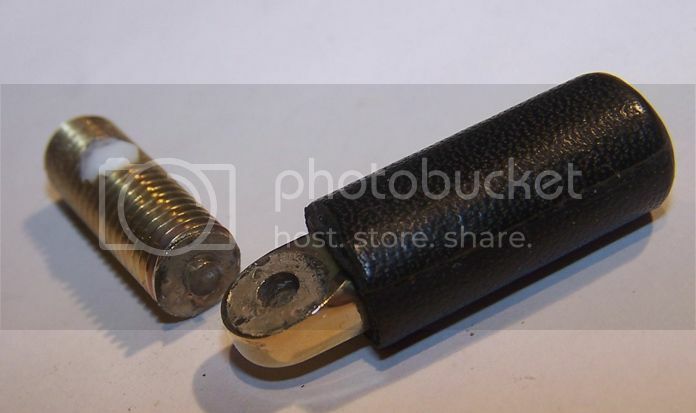 plastic to glue to carbon fibre tube? Matte finish on ABS and Delrin? Delrin AF in small quantity? 10" hole in delrin ? Delrin: pressing bronze bushings into? How do I straighten Delrin? How does deburring tool work? what epoxy do you use to join delrin parts? Delrin square tubing or angle bar? how to tell if cutting board is Delrin ?